Why choose SJRA for your prostate MRI? South Jersey Radiology uses the world’s most advanced 3T MRI unit to perform prostate MRIs. In determining customized treatment options for prostate cancer, diagnostic clarity is key! The new 3T MRI, known as the Skyra, is one of the most advanced MRI systems in the world and, in South Jersey, is only available at SJRA. The Skyra images the prostate with the highest clarity possible and provides views of the gland in thin sections and from multiple directions. The Skyra also eliminates the need for the invasive, uncomfortable endorectal coil, generating the best images possible with an external torso coil. At SJRA, your scan will be interpreted by a specially trained physician with expertise in prostate MRI. Why undergo a prostate MRI? While prostate cancer is the most frequent non-skin cancer diagnosis in men and the second leading cause of cancer-related mortality, many prostate tumors are not life threatening. An overly aggressive treatment plan for a non-life threatening prostate tumor subjects the patient to treatment risks that include incontinence and erectile dysfunction. Historically, prostate cancer screening has relied on a test that measures the level of prostate-specific antigen (PSA) in a patient’s blood. But many factors can result in an elevated PSA and, according to the National Cancer Institute, only 25% of men who have a biopsy due to an elevated PSA actually have prostate cancer. 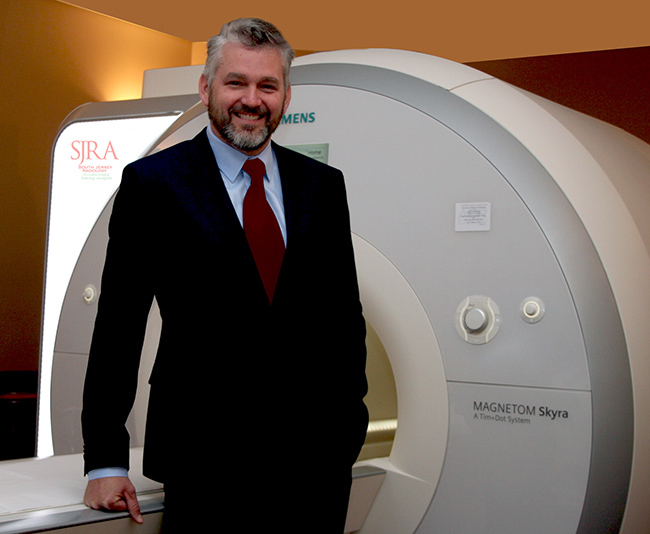 High field strength multi-parametric MRI (such as SJRA’s Skyra) has become the tool of choice for evaluating the prostate in men with an elevated PSA and for staging prostate cancers. The high quality images provided by this revolutionary technology help the physician accurately determine the location and extent of prostate cancer and provide a customized treatment plan. Treatment options may include “watchful waiting,” limited surgery, radiation therapy, and prostate removal. Rather than subjecting the patient to repeated biopsies, the 3T MRI is also useful for monitoring changes in the prostate of patients who have had prior negative biopsy results but are at risk for developing cancer. Preparation is minimal. Patients are asked to use a Fleet enema to empty their bowel and take Gas-X tablets before the exam. Patients cannot eat for three hours prior to the study. Most importantly, you must inform the staff of any metal in your body such as pacemakers, heart valves, aneurysm clips, metal fragments in your eyes, or other sources of metal. This will be reviewed in detail when you schedule your exam. What should I expect during a prostate MRI? You will be asked to change into a gown. You will then be shown into the scanning room and helped onto the MRI table. Patients lie comfortably on their back during the scan. A flexible coil is wrapped around the pelvis. The scanner will make a variety of noises during the exam. Do not be afraid; this is normal for the scanner. The exam takes about 40 minutes of actual scan time. Once the exam is completed, the images will be interpreted by one of our specialist physicians who will communicate the results to your doctor. Prostate MRI is offered at SJRA’s VOORHEES AND TURNERSVILLE offices.